The Beatles, one of the greatest rock groups ever, were together for less than 10 years, in the sixties. However, the success and influence of their songs will last forever. I grew up with the Beatles, so they have always been special to me. 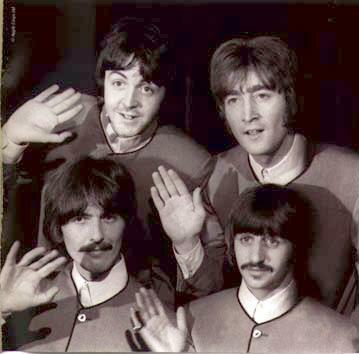 My interest in studying their hands originated from a picture – posted here - where they are all waving. However, in order to analyze their hands without proper hand prints, I looked at hundreds of photos and videos. 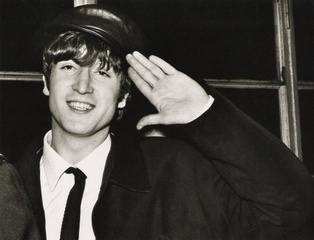 John Lennon was the soul of the Beatles, the one who started the band and wrote and sang so many of the songs. His hand is square and actually wider than the length of his fingers. This makes him active but also impulsive, not caring too much about the consequences of his actions. The lower part of his hand is very large with very round Venus mount (ball of the thumb) attracting him to sense pleasures, and a large Luna mount (opposite side of Venus) giving him fertile imagination and abundant creativity. Like most people in showbiz, his ring finger is very long, providing him with tremendous charisma and public success. However, his index finger is relatively short, which may indicate a lack of self-belief compensated by considerable success. 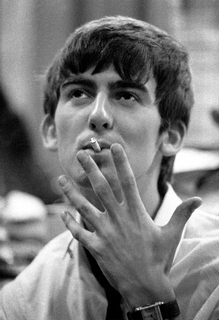 George Harrison, the lead guitar of the Beatles, was known as “the Quiet Beatle”, but I believe he was more “the Serious One.” He started to write songs later on in the Beatles’ life. His hand is very wide but his fingers are even longer, which indicates a very analytical personality. His fingernails are also very broad showing an excellent nervous system and a peaceful disposition, not prone to outbursts. His ring finger is long – as can be expected – but it is almost always bending towards the middle finger, as if he didn’t believe in his success and kept himself from having fun. Also, his little finger is set much lower than the other finger. It usually reveals some difficulty expressing one’s deepest desires. It may have been the reason why he was so interested in going deeper through meditation. 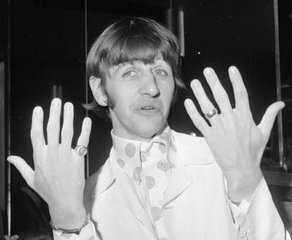 Ringo Starr is described by the other Beatles as “The Heart Beat” of the band, and it fits with his hands. Joining the band later on, Ringo was the drummer as can be confirmed by the sharp angle at the bottom of his thumbs (sense of rhythm). Ringo has a long palm and a very long head line on both hands. He is probably often lost in his thoughts which give him a sense of wonder and the ability to have fun in most situations. His thumbs are very flexible, reflecting his flexible attitude. 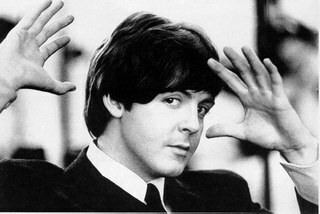 Like all the Beatles, his long ring finger makes his success obvious. Interestingly he often wears a ring on his little finger, which makes him concerned with communication, maybe showing he felt insecure in comparison with the other Beatles. Individually, each Beatle is gifted, but collectively, they created a formidable synergy that has never stopped inspiring people. When the Beatles first appeared on The Ed Sullivan Show in February, 1964, there was no reported crime in the United States during the length of their performance. As George Harrison later commented, "Even the criminals had a rest for the 10 minutes while we were on!" This was the impact the Beatles had.